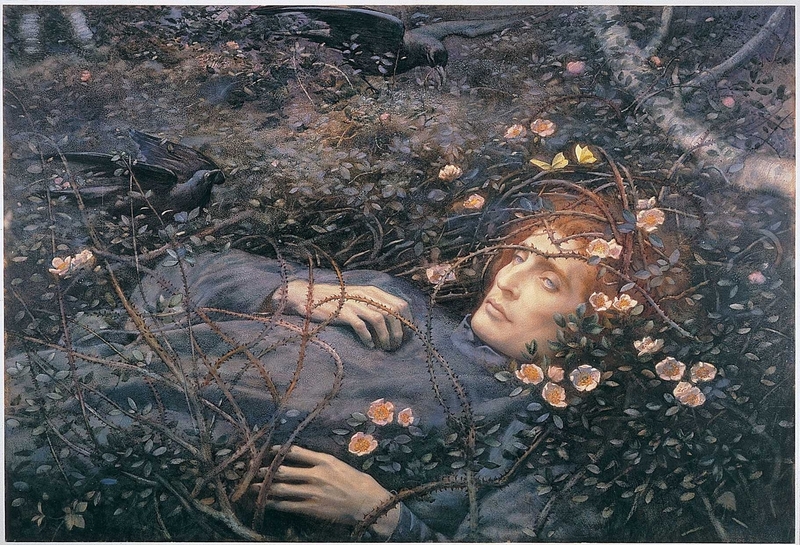 The new exhibition at Birmingham Museum and Art Gallery, ‘Enchanted Dreams: The Pre-Raphaelite Art of E. R. Hughes’ is the first ever exhibition entirely focused on Hughes’s work. Though some of his paintings, especially ‘Night with her Train of Stars’ (1912), are reasonably well-known, his work tends to be overlooked. BMAG own quite a few, but many more have been assembled here from far and wide, and the exhibition draws out aspects of his work which are not always obvious from the few one usually sees. 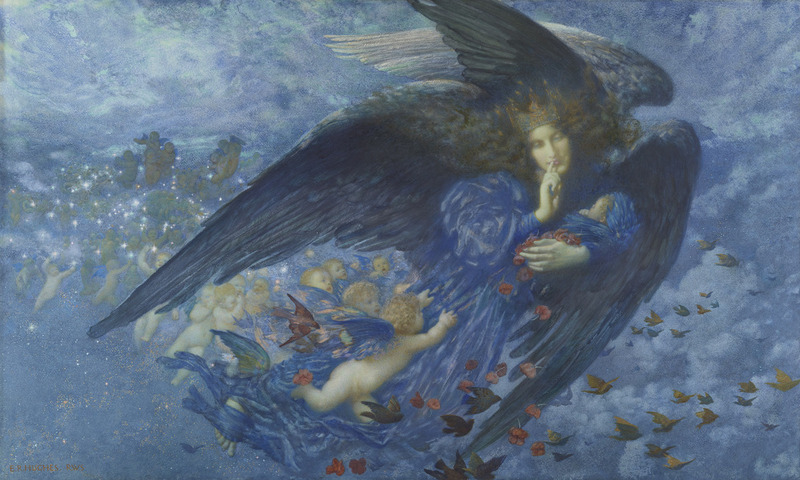 Not to be confused with Arthur Hughes (his uncle), Edward Robert Hughes was also associated with the Pre-Raphaelites, having been brought up among his uncle’s Pre-Raphaelite friends, and these associations have clear implications for his work which are evident in the exhibition. There is a good effort at providing some of this Pre-Raphaelite context in some of the other works included in the exhibition, by Arthur Hughes (‘The Long Engagement’) and Simeon Solomon (‘Bacchus’), for example. Hughes is perhaps most famous for his ‘t wilight’ paintings, of which more later, but his earliest known work, ‘Evensong’, already indicates his interest in the effect of twinkling lights in painting, and the shadows cast by light. Though this domestic scene is perhaps a little sentimental, even immature, it is still beautiful, and shows the promise of his work. Hughes’s early career as a portrait painter is explored, demonstrating how his works are considerably more than pot-boilers: the double portraits of the Gray Hills, for example, are rich in every sense, depicting a well-fed, middle-aged wealthy couple, and yet in their debts to earlier styles of work, the richness of colour used and the evident complexity of the relationship between the couple, the painter and the viewer, these suggest a psychological intensity which a jobbing painter doesn’t usually manage. Similarly, those of children, such as ‘Dolly Francis’, are unsentimentalised, managing to both respect the conventions of Victorian portraiture of children whilst permitting the child her individuality, staring unsmiling at the viewer. Hughes’s influence on Estella Canziani is mentioned, with the portrait of a woman in mourning costume (right) on display: her portraits of figures in folk dress made on her European travels are a fascinating example of the art of an intrepid woman of the period. Hughes’s engagement with literature also interests me. ‘Study for a Picture: Fra Lippo Lippi’ is a wonderful, red chalk portrait with a remarkable life to it, inspired by Robert Browning’s dramatic monologue ‘Fra Lippo Lippi’. 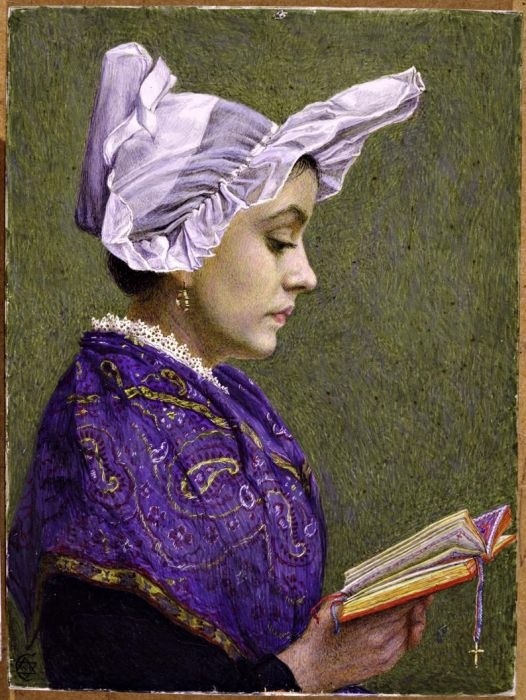 The realistic style advocated in the poem is echoed in the portrait, and the idiosyncratic and dramatic character of Browning’s monk shines through the eyes of Hughes’s work. Similarly, ‘Oh What’s that in the Hollow’ (left) is based on Christina Rossetti’s poem ‘Amor Mundi’, reminding the reader/viewer of the transience of life, and that to neglect the spiritual aspects of life is to risk eternal damnation. The painting is peculiarly macabre, the figure clearly corpse-like, and overgrown with brambles and briar roses, indicating the continuation of the world in the face of human mortality. For many the highlight of the exhibition will be the ‘Blue Room’ of late watercolours, containing not only ‘Night with her Train of Stars’ but also ‘Midsummer’s Eve’ (right). Here, the majority of the paintings are in beautiful blue tones, with Hughes’s signature spots of light giving a dreamy, twilight feel to the whole room. Mostly painted in the early days of the twentieth century, the aesthetic approach of the paintings suggests, nostalgically, a lost innocence in the years before the First World War. Though a few are ‘fairy pictures’, the exhibition as a whole indicates that Hughes is much more than a painter of sentimental fairies; his technical and emotional as well as aesthetic accomplishment is manifest in this exhibition which, finally, does him credit as an artist. Incidentally, I attended the exhibition this week with a large number of students (I’ll blog about this another time!) who were equally drawn to Hughes’s work, in very different ways; they are writing creative responses to some of the paintings, which I’ll share on here in a few weeks’ time. There is also a fun ‘Fairy Glen’ for children visiting the exhibition!